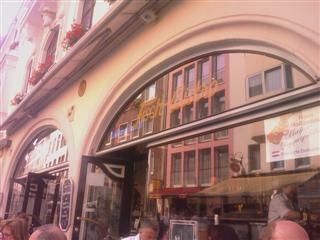 Whilst visiting Dusseldorf for work we ate twice in the Aldstadt or old town. Saturday night we found an excellent Argentinian steak house and visited several brewhouses and on Sunday we had an early dinner/late lunch at the Fischhouse on Berger Strasse. The weather was warm and sunny so the outside seating was the only place to eat and watch the world go by. 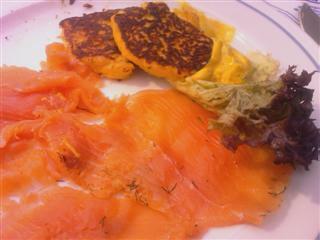 For an appetiser I chose smoked salmon with warmed potatoe cakes which was very nice and a very generous portion of salmon. The main course had to be something with asparagus as the season was in full flow and heavily featured on the menu specials. 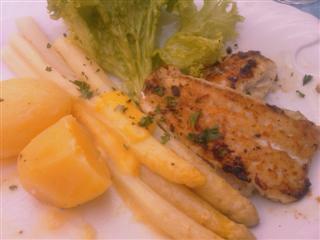 I chose perch with asparagus and potatoes and was not dissapointed. 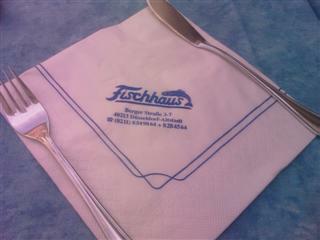 The meal was washed down with a house white and ended an exhausting yet interesting visit to Dusseldorf. I was in Germany visiting the DRUPA ( Printing and Graphic Arts Exhibition) and went to a traditional Brewery Pub. There was a set Menu and typically as much beer as you can drink which was brewed on site. I had a huge Slow Roasted Pork Knuckle which was a first. The meat was very tender and incredibly flavoursome. Phil and I will have to try get some Pork Knuckle from the Farm Shop and have a go……….. The starter and desert don’t even deserve a mention but the Fruh Reisling was excellent.